In Switzerland, Dr. Grégoire Courtine, a professor of neuroprosthetics, is working to help the paralyzed walk again. The implants can transmit nerve signals on damaged spinal cords, acting like a patch on a broken wire that restores signal and movement. Courtine and his team first studied lower-limb paralysis on rats with partially severed spinal cords. After that they tried implants on monkeys. Now, they are running clinical trials on humans. Dr. Courtine’s team partially severed 27 rats’ spinal cords. They left tissue still connected but cut the nerves so the connection between brain and spine was lost and the rats lost the ability to move their hind legs. A cocktail of chemicals that improve nerve signal communications was injected into the rat’s spine, then the rats were given mild electrical stimulation. After a few weeks, the rats were able to move on their own, and regrowth of nerve connections appeared on the spine. Dr. Stéphanie P. Lacour, another professor of neuroprosthetics, created an e-dura soft spinal implant, which was implanted into the rats. The implant is made of stretchable silicone and is less damaging than rigid implants. The implant can send signals and medication to the nerves, stimulating healing. The rats were able to heal with electrical stimulation and other chemicals that improved the signal transmissions. Next, Dr. Courtine’s team experimented on monkeys. 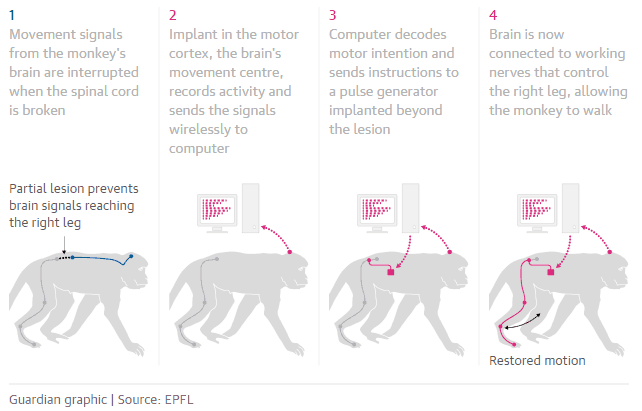 A brain implant in the monkey bypasses broken nerves and allows the monkey to move its legs again. The implant can re-establish links and strengthen existing connections, which might allow injuries to repair themselves. One monkey was able to move its leg less than a week after the implant. Another monkey had a more serious injury but was also able to move in two weeks. Both monkeys had full recoveries and the spinal implants resulted in natural leg movements. Researchers believe that the implants can be used in rehabilitation centers for humans soon. The first human clinical trial is taking place at the Lausanne University Hospital. The patients are also put into a harness to keep them upright during physical therapy. The Medtronic implant is a commercial device that has already been approved for other applications. The implant has to be positioned on the lumbar spine in the lower back and have the 21 electrodes correctly positioned. The electrodes need to be able to reach nerves that make the legs flex and extend. The electrodes are then tested to see which current levels affect the leg and can have it simulate walking motions. The researchers hope that one day they will be able to use Dr. Lacour’s stretchy silicone implant, but it will not be ready for clinical trials for another few years. The trial will include eight patients who have varying degrees of severities of spinal injuries and paralysis. The study will last five months. It will track how well patients can walk as well as any improvement gained over that time period. The researchers are working with BrainGate to develop a brain implant, similar to the one they implanted in monkeys, for humans. They hope that with the help of the brain implant, the paralysis can be healed. You can read the full paper about the spinal implants here.